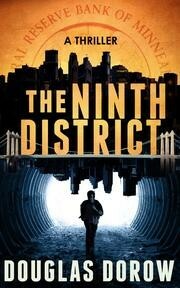 The Ninth District intrigued me just as much as any book I've read by John Grisham. The characters are real and it's obvious Douglas Dorow draws from inside knowledge of what goes on behind the scenes of various law enforcement professionals; if he doesn't, he certainly knows how to spin a good tale and keep the facts straight. Special Agent Jack Miller and - dare I call him Special Agent Junior (actually, Ross) Fruen - have a real challenge on their hands, trying to predict where a bank robber, turned murderer, will appear next. It doesn't seem that he is after money so what could it be - and why has he resorted to murder? Why does he look into a security camera and salute each time before leaving a bank? The Ninth District takes us into various places around Minneapolis, Minnesota - a city I have actually passed through on a couple of occasions - which made it especially nice. There are various elements which pulled together to captivate me: seeing Jack Miller spending time with his family, enjoying nature through his eyes as he ran along the river each morning, watching Jack and Ross (Junior) trying to identify the bank robber, among other things. As with any great story, there is generally a theme behind it; it may announce itself in a sentence or in one specific act. There are a few themes which presented themselves in The Ninth District but one of the strongest, for me, was that sometimes we are forced to face our worst fears. Special Agent Jack Miller is claustrophobic so going into the tunnels below the city, with nothing more to lead him than a headlamp and a guide, is not his idea of having a good time. Dorow vividly portrays Jack's fear of taking the first step toward facing that particular fear, having another character, Mike, reminding him that he had to catch the bad guy. Sometimes, in life as in fiction, we have to face our fears. We may be in danger of losing our families, our jobs, our health, our homes, our reputations or any number of things. However, we can't stick our heads into the sand pretending nothing is amiss. Sometimes we don't need to do much more than be aware of the possibilities. Sometimes, we can be proactive and have a backup plan before the proverbial crap hits the fan. Sometimes, however, as in Jack's case, we have to face our fears head on - to catch the dragon by the tail and do our best to slay him, no matter what it takes; otherwise, the fear will never go away. I must admit that I got caught up in reading this story, which was much longer in length than most other titles I've read. However, it seems the pages turned rather quickly, even as I took my time to read every word. If you would like to learn more about The Ninth District or to purchase it yourself, feel free to click on the book cover which will take you to its page on Amazon.